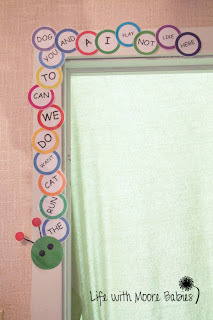 Word Caterpillars are not new; I have seen them all over the internet as a fun alternative to a basic word wall. 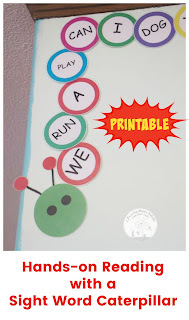 I had intended making one for my kids as soon as we started learning Sight Words, but that didn't happen. Finally after covering 15 or so sight words I sat down and got started. We really needed a way to review! Luckily my procrastination led to a fun result. 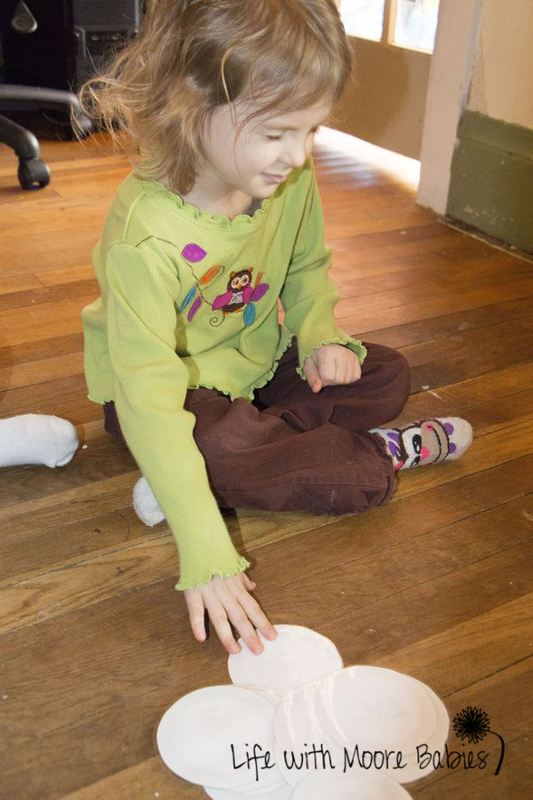 I already knew my kids were active learners. 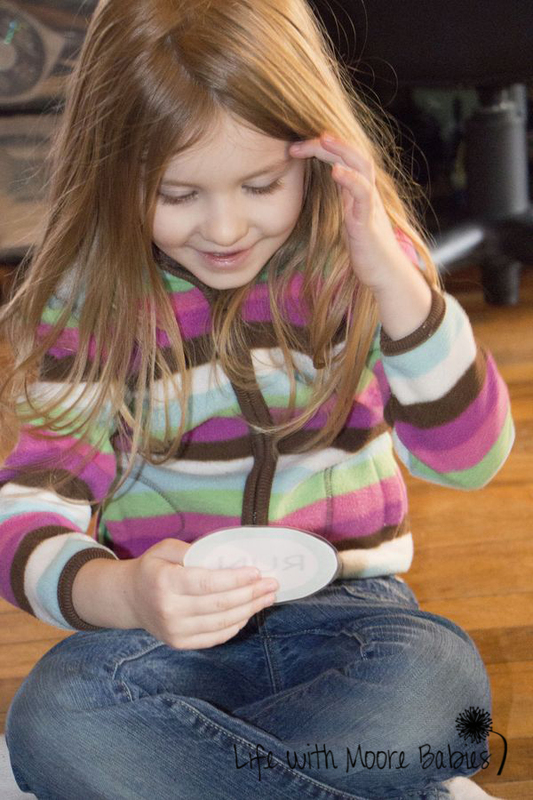 You know the kind, the ones that can't sit still, the ones that learn better doing hands-on projects, yep, that's my kids. I also knew it was hard to find hands-on ways to learn to read, but my little word-a-pillar was going to help! Since we had so many words to start our caterpillar with, we were able to play a little game as we assembled it. After printing and laminating (we just use this simple laminator) all the current words, I laid them in a pile face down on the floor. The girls took turns drawing words. 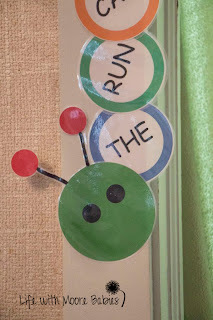 If they could read the word they drew they got to hang in on the caterpillar! This was VERY exciting to the girls! I guess there is something special about getting to tape something to the wall (or door frame in this case) or maybe it was just that they were reading. We kept going, and going, until most of the words were up. If they came to a word they didn't remember, it went back in the pile. They got stuck on the word "here," so I got to hang it up, not nearly as exciting as they were making it out to be. 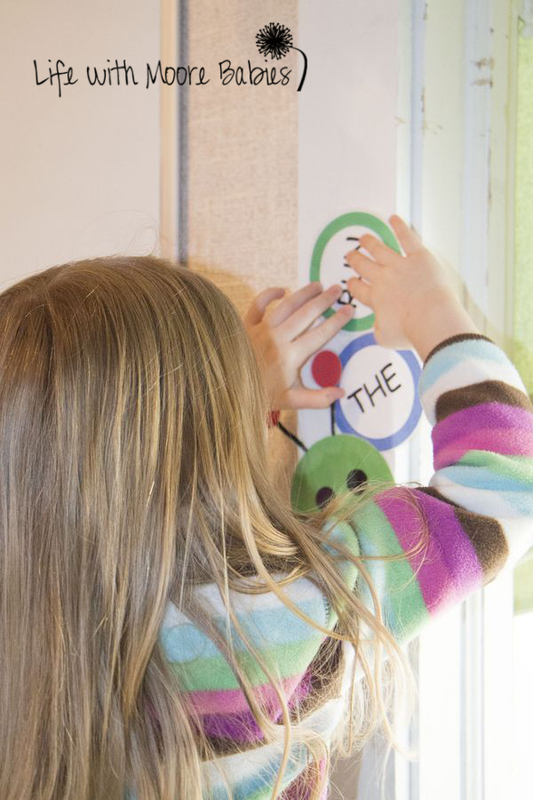 And just like that our Sight Word Caterpillar was started. 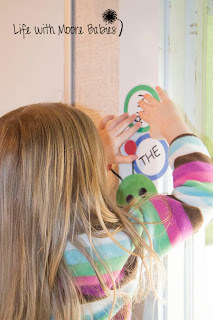 We covered 4-5 words each week, and at the end of the week we would play a mini-version of the game to hang up our new words. 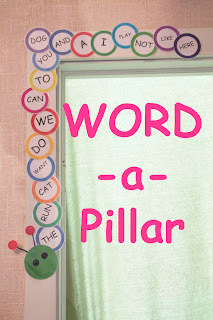 We can also use it to review words, since the circles are laminated we can take them now at any time to play a new game of Build a Word-a-Pillar! That's right, you can print a copy of our Word-a-Pillar for use in your home or classroom because most kids enjoy active learning even if they learn through another method too. 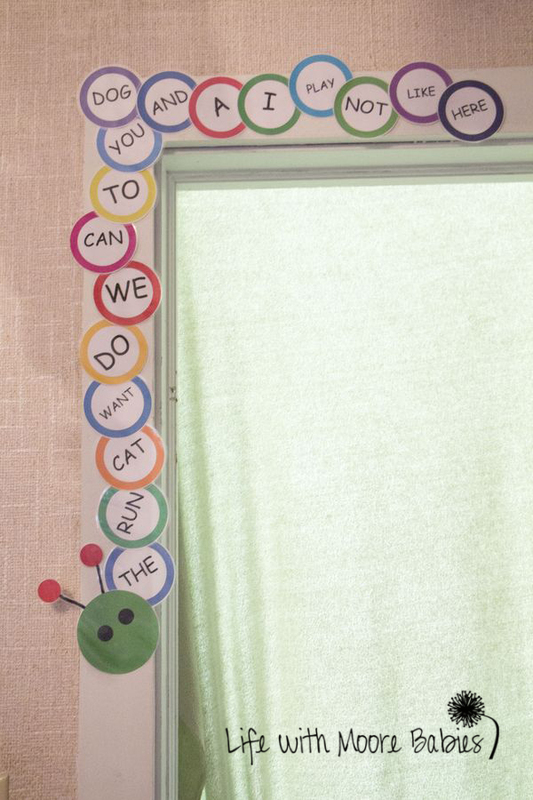 Our entire word caterpillar includes over 240 sight words. 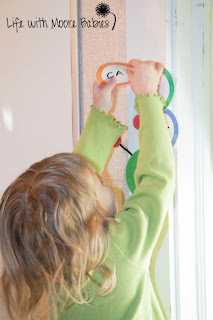 I am sorry they are all in capitals; when I made it my girls already knew both capital and lowercase letters, and I thought capitals would be easier for them to read from the floor! 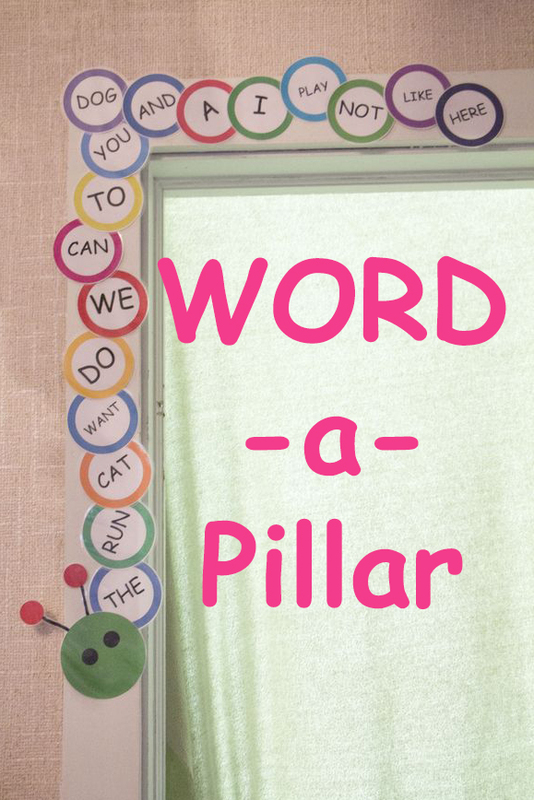 Want to make your own Word-a-Pillar? Here is the PDF version of mine !